The recent rise in sector sales reflects cash-strapped consumers' demand for interesting and affordable staples. Even the recession and rising prices have not diminished the British public's affection for pasta, rice and noodles, with sales increasing 13% between 2008 and 2010 to reach a value of £1.47bn, according to Mintel. Meanwhile, sales of potatoes, the traditional British staple, have dipped 40% in the past 20 years, according to the Potato Council. Pasta, rice and noodles are now widely consumed staples, perceived as both convenient and good value. They are particularly popular in households with young children as they are well-liked by even the fussiest of eaters, as well as being relatively healthy. All three of the categories in this sector have benefited from the rise of cooking from scratch at home - a trend driven both by the healthy-eating focus and the recession. 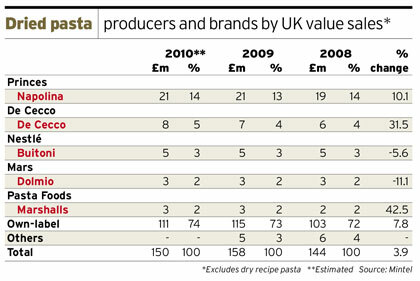 Pasta forms the biggest part of this market, accounting for £813m of sales in 2010, and dry pasta dominates (72% of people consume it compared with just 24% who eat fresh variants). 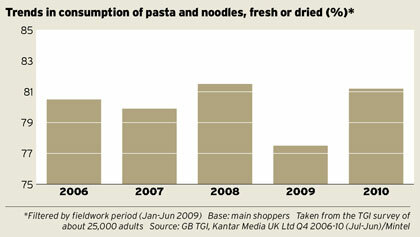 Pasta consumption is slowly rising, fuelled mainly by 16- to 24-year-olds and those with young children. 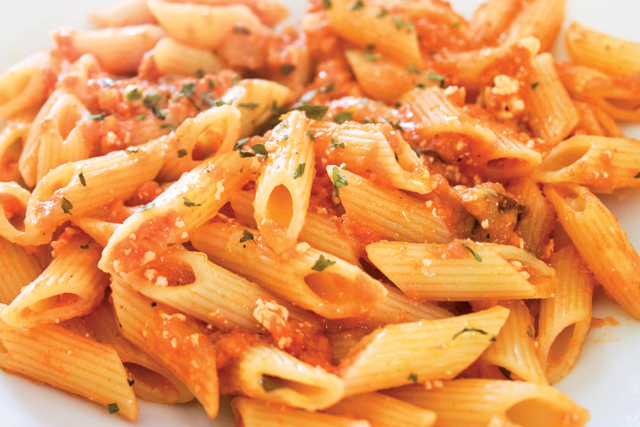 About one in four pasta consumers eats five or more types, according to Toluna. Demographic changes have helped this sector: the number of ABs and 25- to 44-year-olds has increased and both groups consume more pasta and noodles than any others. While rice is being bought in bigger packs, there has been downward price pressure as consumers have shifted to budget brands. 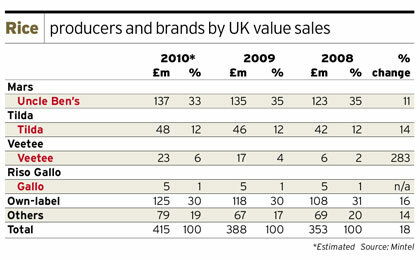 Rice sales were worth £415m in 2010, according to Mintel. The share of market leaders Tilda and Uncle Ben's stalled in 2009 and 2010. Noodles have grown slowly in popularity, but with 27% of consumers never having eaten them, there is scope for manufacturers to build their share. 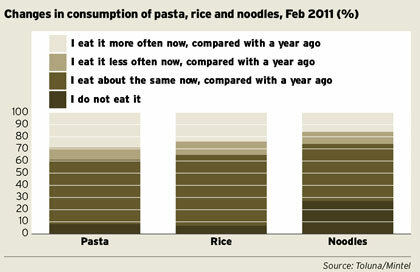 Instant noodles are bought most frequently, while fresh noodles have yet to make a significant impact. Strongly flavoured Asian cuisine has helped the noodle market, though, and there has been considerable NPD in this area, including Blue Dragon's Japanese Noodles, Amoy's Straight-to-Wok lines and the recently launched Kabuto pot noodle range. Crispin Busk, founder and director of Kabuto Foods, says: 'Noodles are one of the world's most popular foods and noodle bars are popular in the UK, but until now there hasn't been a high-quality instant offer.' The products are available in selected Waitrose, Harvey Nichols and independent stores. This sector has not been hit by the health criticisms levelled at many foods, but some products have been slated for their high salt content. In 2009, for example, Uncle Ben's reformulated its microwaveable Express rice range with a lower salt content. The other area of focus for NPD has been on convenience. Uncle Ben's Express has extended its range of flavours and added Family Size packs; Veetee added Basmati and Mushroom variants to its Dine In range; and Batchelors added Pasta Pot Shots. 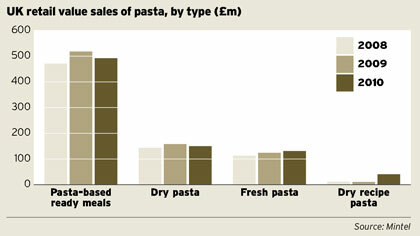 Own-label dominates the pasta and pasta-based meals category, with about three-quarters of sales. Napolina is the biggest brand here, although De Cecco has posted strong growth, up more than 30% between 2008 and 2010. The noodle category bucks the trend toward own-label, with branded products performing better; however, this could reflect the fact that there is less choice among supermarket brands in this segment. Pot Noodle is the top brand in terms of sales, even though instant noodles come some way down the list of 'types of noodle eaten' in Toluna research findings. Mintel estimates that this market will grow by 26% to reach a value of £1.84bn by 2015. Most of this growth will be a result of inflation from higher costs and a shift toward premium products. It is the equivalent of a 4% rise over the forecast period when inflation is taken into account.